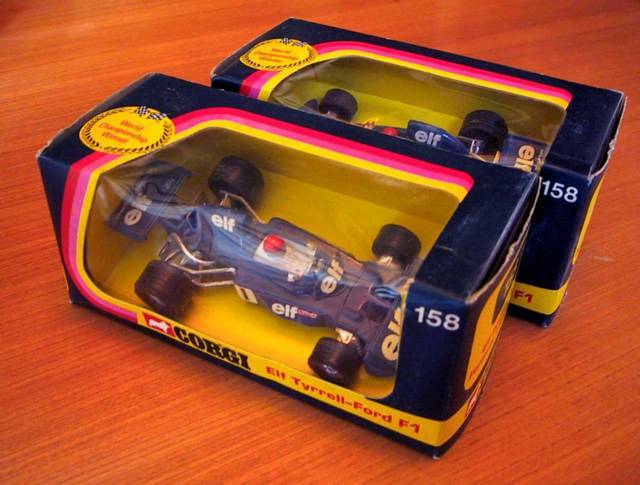 Recently, I accidently purchased two of these 1000% cool Corgi Formula 1 Elf Tyrell-Ford World Championship cars made famous by the Flying Scotsman himself, Jackie Stewart. Knee high to a grasshopper, not afraid to wear a tartan hat with a pompom, big sideburns, he was every kid's racing hero, as he was our size and dressed like we would if Halloween was everyday. The Mister Jalopy collection has room for exactly one of these, therefore, the second is available for sale ($25), with, as always, 10% of the proceeds directly benefiting the Chinatown Incubator. Alternatively, accepting immediate trades for John Player Special F1 Corgi of the same era.